Marketing is a game where the liars lose and storytellers succeed. 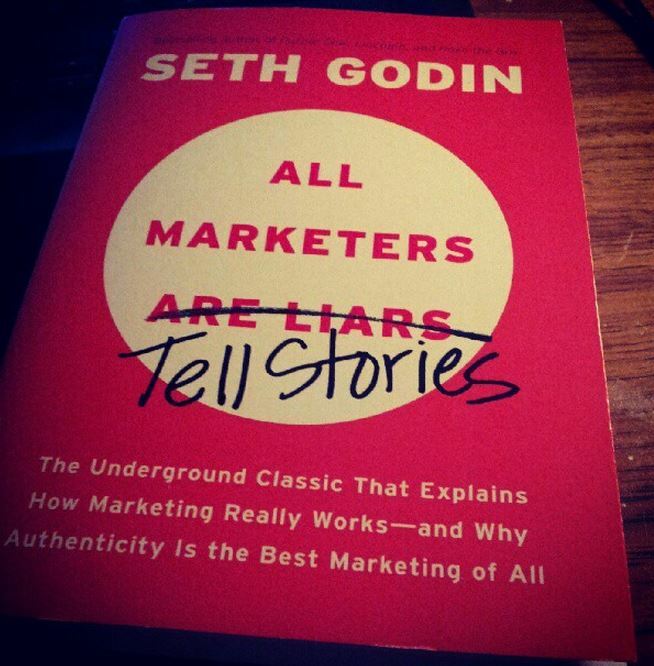 In All Marketers Tell Stories, Seth Godin uses his distinct voice and clever wit to tell a story about stories. Godin takes readers on a journey into the mindset of the consumer, and reveal how stories inspire action – but not just any story, their story. It starts with a lie. The lie consumers sell to themselves, and the lies they share with others. “We believe what we want to believe, and once we believe something, it becomes a self-fulfilling truth.” This insight allows us to understand the psychology of want. Consumers are irrational, and driven by what they want more often than what they need; facts become irrelevant in the face of belief. The art of storytelling began when humans needed a way to communicate with each other and understand the world they live in. “The best stories agree with what the audience already believes and makes the members of the audience feel smart and secure when reminded how right they were in the first place.” Godin calls this concept a worldview – the lenses people use to determine whether or not they’re going to believe a story. Worldviews consist of rules, values, beliefs, and biases, which lead people who see the same data, to make different decisions. You don’t get second chances at making a first impression. “In order to survive the onslaught of choices, consumers make snap judgments.” Godin ultimately takes us on a journey designed to give marketers a better chance at making a great first impression. Once people make up their mind about something, once they believe things a certain way, they lock themselves into that story. “The pieces of the story come together in an instant and the story is told.” Anything contradictory will be ignored, resisted, or even attacked. That’s what a first impression is. A first impression is the first story about the brand that the customer believes is true, and once it happens, it’s almost impossible to change, because it’s beyond the marketer’s control. “You’re not in charge, you can’t control the conversation.” However, marketers can control how they portray themselves to spark the conversation. In a modern society where most needs are met, all that’s left are wants. What humans want more than anything else, is to live their story. To experience our life as a story, to have a story, and to share that story with the world. Can Empathy Create Blue Oceans?